Alstom has signed an agreement with Dutch infrastructure operator ProRail and short line rail firm Rotterdam Rail Feeding (RRF) to perform Automatic Train Operation (ATO) tests in 2018. The ATO system automates the train driver’s operations while he focuses on supervision tasks. The tests should optimise the railway operation, reduce energy consumption and increase ride comfort, providing added value and railway modernisation. 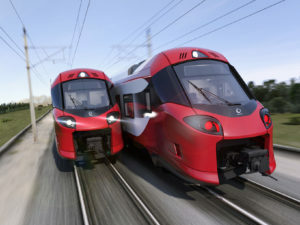 These tests will be performed with a GoA level 2 of automation on the ERTMS equipped Betuweroute – a 150-km double-track freight line connecting Rotterdam to Germany, part of the European freight Corridor A. This system has already proven its advantages on metro networks. The trains equipped with ATO operate at closer intervals, which increases the capacity of the railway network and allows for reduced energy consumption, because trains operate more uniformly. Automated operation can therefore be an added value for operators without making expensive changes to the infrastructure and is one of the next logical steps to meet the Paris Climate Agreements. The test drive on the Betuweroute will focus on ATO application to freight transport. The purpose of the tests is to perform a live demonstration with a locomotive running in ATO from the Rotterdam Harbour district to CUP Valburg in the eastern part of the Netherlands. The locomotive, provided by RRF, will run approximately 100km without driver intervention on rail sections equipped with two different ERTMS levels (1 and 2). The Betuweroute was successfully equipped by Alstom with the European standard signalling system ERTMS 10 years ago and ERTMS supports automatic operation better than the classic security systems. Automatic shunting movements on the yard of CUP Valburg will also be tested. Automated trains are on the innovation agenda of several countries and Alstom is leading the development of ATO for rail. Alstom’s close collaboration with ProRail and RRF will contribute to support the progress of new technology and create a more attractive, more competitive and more sustainable rail system. By being closely involved in these developments, Prorail and RRF show their willingness to bring automated trains in the Netherlands and contribute to the development of a modern railway system.